ESCANABA---One step forward, two steps back. 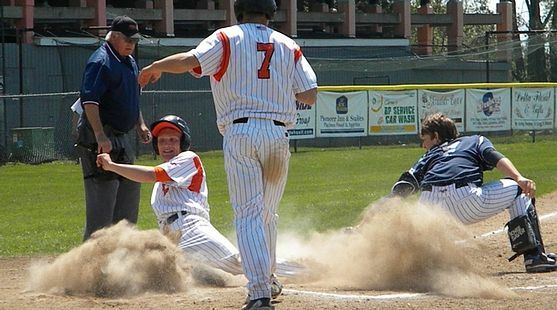 That old saying applies to the Escanaba High School baseball team as the boys hosted their final tournament of the season on Saturday. The Eskymos made up for two poor performances by beating the Alpena Wildcats Friday night, but the problem of late-game errors returned in Saturday's game against Petoskey as the Eskymos lost late, 4-2. Escanaba managed to pull out a come-from-behind, 6-3 win over the Negaunee Miners in the third place game in a contest that included numerous hit-battsmen. Alex DeHaan had nine K's vs Petoskey. "We were down emotionally because we lost a tough first game," Eskymo Head Coach Kirk Schwalbach said. "I told the kids that I'm proud of them, because they came back and pulled it out. We could've threw in the tank after we fell behind 3-2, but the kids kept playing." But it was the first game against Petoskey that will be most remembered about this day as the Eskymos wasted a good pitching performance by senior Alex DeHaan. It will be remembered, also, because of the number of missed opportunities to put the Northmen away, and by DeHaan's own error that started the team's late downward slide. The game against Petoskey was a possible district final preview, as the Eskymos will open the playoffs against Cheboygan and the Northmen will face Sault Ste. Marie in its opener. And things look good for the Eskymos as the game started under sunny skies. Escanaba took an early 2-0 lead as Austin Young singled and stole second, and Nick Vandermissen was hit by a pitch. DeHaan brought both boys home to make it a 2-0 game in the first inning. Then, in the second inning, the Eskymos had the chance to throttle the Northmen and their starting pitcher, Jordon Smith. Tyler Skufca led up with a hit, then Ian DeMarse bunted back to the pitcher. Smith threw it high for an error, and DeMarse was safe. Cam Beversluis followed with a single, loading the bases with no outs. But moments later, Skufca tried to score on a passed ball and was tagged out at the plate. ThenYoung popped up and Ben Kleiman grounded out. It was yet another case of missed opportunities for the Eskymos, but DeHaan was pitching so well that it looked like it wouldn't matter. DeHaan struck out nine batters in the first five innings, and the Eskymos still held that 2-0 lead. Then in the bottom of the fifth, Beversluis got another hit and Kleiman drew a walk. But with two men on, Vandermissen popped up and DeHaan grounded out. In the sixth inning, things went south quickly for the Eskymos. DeHaan got Hunter Stinger to pop it up, but after calling off his infielders, DeHaan had the ball hit the heel of his mit and it bounced away for an error. One out later, Dillion Kelly battled DeHaan for 13 pitches before drawing a walk. Then DeHaan walked Mitch Smielewski. Austin Young and Sean Bissell confer. With the bases loaded, and DeHaan's pitch count well over 100, Schwalbach turned to fellow senior Young to get out of the jam. Young got Smith on a called third strike, but with two outs, an inside pitch hit Cole Paul, forcing in the tying run. Then, in the seventh inning, Young struck out the first man he faced. But David Waterson got a base hit, then Stinger followed with a hit on a 3-2 pitch. With two men on, clean-up hitter Joe Robbins scorched one back up the middle that Young snared in his follow-through. But there was confusion between Vandermissen and Kleiman on defense, and neither one got Young's throw to second. The go-ahead run scored. Moments later, Kelly hit a ground ball against a drawn-in infield to third baseman Skufca. Skufca dove and trapped the ball, but threw home instead of to first base (it was not a force situation). The throw was late, and the Northmen led, 4-2. Escanaba did not go quietly in the bottom of the seventh. Ian DeMarse led off with a single to center field. He was forced out by a Beversluis grounder, and Young popped up. But Kleiman walked, and Vandermissen singled to load the bases. That brought up DeHaan, with a chance to tie the game with a base hit. He flew out to center. Game over. Ian DeMarse was at first base all afternoon. "Alex pitched so well, but we just couldn't get the timely hits," Schwalbach said. "We had opportunities twice with the bases loaded, and just couldn't get a hit." So the game counts as another case of lost opportunities for the Eskymos. And in the third place game against Negaunee, the Eskymos came oh-so-close to another one. Once again, the Eskymos jumped to an early lead as Young led off the first inning with a pop double down the left field line and Vandermissen was hit by a pitch. DeHaan's base hit drove in the first run, and Kleiman made it 2-0 with a ground ball to second. Escanaba had a chanvce to do more damage in the second inning, loading the bases with two out. But Vandermissen grounded out to end the threat. Sophomore Jeff Lyle was on the mound for the Eskymos, and he was helped out with two double plays behind him in the first three innings. It was still 2-0 in the fifth inning when the Eskymos loaded the bases on two walks and a DeHaan hit-by-the-pitch. But DeMarse hit one back to the mound for a 1-2-3 double play, ending the threat. And it was DeHaan's HBP that set more events in motion in the bottom of the inning. The Miners felt that DeHaan had leaned into the pitch and should not have been given first base. Also, pitcher Cory Larson was frustrated after several pitches were not called strikes by a rookie home plate umpire. So, in the bottom of the inning, four Miners batters were mysteriously hit by pitches, leading some to believe that the Negaunee players were instructed to lean into pitches. An unhappy umpire crew chief, Nick Nolde, summoned both coaches to home plate for a tonguelashing designed to end the "beaning" of players. But the four HBP's in that inning, along with a double by Jake Dorie, gave Negaunee a 3-2 lead, ending Lyle's day. "We played through it, and I think our kids played with class," Schwalbach said, not wanting to discuss Negaunee's strategy of crowding the plate. Austin Young got the win vs Miners. Young came in to pitch again, and he retired the final two men he faced, and then, Young got the Miners 1-2-3 in the sixth inning. But in the top of the seventh, the Eskymos were still behind, 3-2, and they were down to their final out when Kleiman hit one back up the middle, scoring Vandermissen with the game's tying run. "Ben beats himself up because he wants to succeed all the time," Schwalbach said. "I'm glad he finally came through with a big hit for us." After DeMarse walked, Tim Lueneburg hit a tap past the mound. Larson fielded it, but could not get Lueneburg at first. The ball also got away for an error, allowing Kleiman to score with the go-ahead run. Bailey Lamb then came up with a pinch-hit, two-run single to make it 6-3. Young retired the side in order in the bottom of the inning to end it. Ben Kleiman Ties Game In 7th. Alpena won the Binks Tournament championship, scoring four runs in the first inning and then holding on to beat Petoskey, 6-5. Escanaba (17-10) is off until Thursday, when the Eskymos and Miners will have a rematch at Negaunee's IronTown Field. Game time is 5:00. The game will be broadcast live on WCHT-AM (600), and on-line at www.rrnsports.com. Click the thumbnails in the "ARTICLE HIGHLIGHTS" box to see pictures, videos, and listen to audio from Saturday's games. Thanks to Holly Bockman and Kevin Lyle for taking those shots for this report.